My dad needed a new comforter for his bedroom. He wanted paisley and blue, I wasn't sure that I would succeed in finding that combo, but, of course, Overstock came through! He's very happy with the set, which replaced a hideous assortment of blankets he previously used. Brighten up your space with our fun and classy Pure Melody Paisley comforter set. 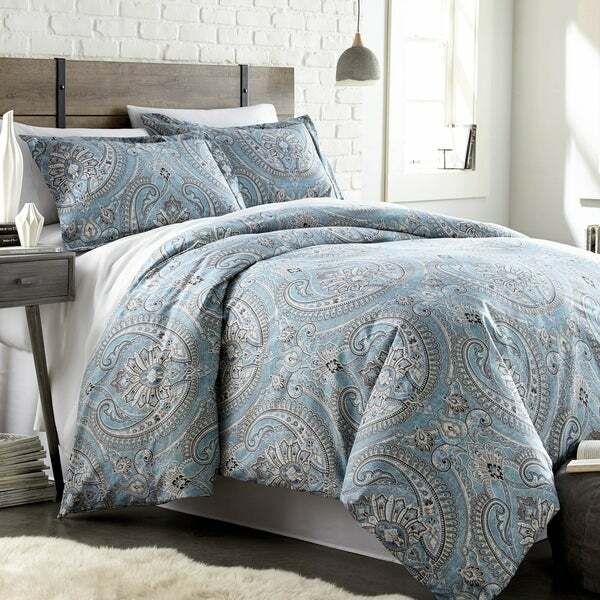 The stylish paisley pattern will bring perfect harmony to your bedroom while our all-season fluffy comforter will incite you to stay snuggled up in your comfy bed. LOVE LOVE LOVE LOVE LOVE this comforter set. I have a queen size bed, but ordered the King comforter. I like the longer look and being able to really snuggle up with my comforter. It is beautiful and the weight of the comforter is perfect for Florida weather. Not too hot, not too cold ... just perfect for me. I tend to be a bit on the cold natured side so this is just the correct weight for me. I have 5 cats with their claws and so far, this comforter has not been snagged or torn by them constantly jumping on and off my bed. Lots of compliments. This is very pretty, warm, and looks great in our master bedroom. I was looking for a very yellow-green to match our walls (Benjamin Moore Rainforest Dew), and although this isn't quite yellow enough to match it is a very yellow green and coordinates well enough. One note--we ordered the king for our king-sized bed, and it is NOT wide enough to cover the mattress if put on the bed the direction it is supposed to go. I turned it 90 degrees, so it's actually on sideways, and it is comfortably wide enough that way to cover the mattress but let the side rails show, and it is still plenty long enough. The pattern is busy enough that unless you are looking carefully you can't really tell that it's sideways. I do like the comforter, but I am not sure I would have bought it if I knew that it wouldn't be big enough lying the right way. If you have smaller than a king, definitely order a size up. I bought this comforter in king size for a queen size bed. It’s not as wide as I’d hoped, doesn’t go to the floor. Still, the weight is good for Michigan winters and shouldn’t be too heavy for the summer. The fabric is soft and colors are muted. Overall, I’m happy with my purchase. Extremely nice comforter set. I wish it had a dust ruffle to complete the ensemble. It appears to be of good quality and seems to be made well. The color and pattern are as pictured. Overall I would say that this is a great price for the good quality product. The comforter and pillow shams are soft and well made. I love this comforter. For the first time in a long time I'm happy about a comforter. It has plenty of padding to keep me warm at night and I just love the color and design. Thanks. Love this comforter. It is soft, fluffy and the perfect weight. You have gotten many compliments on my comforter set. The print is soft and elegant and it feels wonderful. I love the quality of the fabric too! I really like this comforter it has a nice feel to it and the colors blend well together. I have a firm size bed and was afraid it would be too short but to my surprise it fit my queen size bed perfectly. I would defiantly recommend this to a friend. Love this!! Looks great on our kingside bed! The colors are light blue green with grays! Great fabric! Fits over our king mattress perfectly! Highly recommend! I bought this for our guest room with no high expectations. I was surprised to feel how soft it was and it was made very well. I love the colors, goes with the room perfectly! beautiful colors -great quality !!!! The fact that it is “oversized “ is awesome ! Was everything I hoped for and more. Love this comforter not only for coloring but also because the inside is super fluffy, so it makes for a comfortable covering at night. "Someone mentioned it was "oversized". Does it fit a king size pretty well? Does is hold up after a wash? Is the material pretty soft or itchy?" "Is there gray in this comforter, or more of a taupe?" Bedroom remodel/paint - needs a new comforter too!